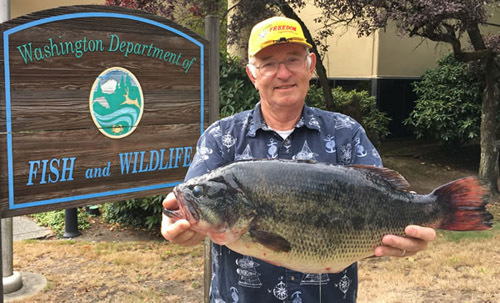 A fishermen recently set a new state record for largemouth bass caught in Washington state waters, according to the Washington Department of Fish and Wildlife (WDFW). Bill Evans of Bothell caught the 12.53 pound bass Aug. 8 in Lake Bosworth in Snohomish County. The fish measured 23.0 inches long with a girth of 22.5 inches. Evans landed the bass while fishing with a Strike King 5-inch Shim-E-Stick, wacky-rigged on a 1/0 hook. Evans is a seasoned bass angler with nearly 40 years of experience. He moved to Washington a few years ago, and just started bass fishing in the state this summer. Evans has fished several lakes in the Bothell area, but this trip was his first time fishing at Lake Bosworth. The previous record was set by Carl Pruitt in 1977 at Banks Lake with a fish weighing 11.57 pounds.